Training a puppy to 'Sit'! on command is easy with our step-by-step guide. Simply follow our step by step guide below . 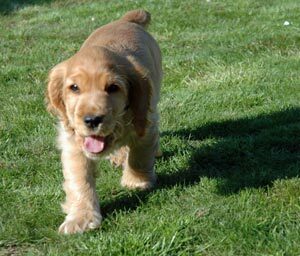 These simple puppy training tips will help you teach your Cocker Spaniel some good manners. How To Train A Puppy To 'Sit'! Before you begin training a puppy, find somewhere quiet, away from distractions, otherwise your puppy won't be able to concentrate and you'll achieve nothing. Say your puppy's name and when he comes over to you, use the 'Watch!' command to get his full attention. Take a treat and hold it between your finger and thumb so that your puppy can see it. Move your hand towards your puppy's nose, treat between your fingers, palm facing towards him. As your Cocker moves to sniff the treat, lift your hand higher and slightly back above his head and towards his tail. As your hand moves over your puppy's head, his nose should follow the treat. He will lift his head upwards and slightly backwards. In doing so, his bottom will automatically move towards the floor and he will naturally end up in a sitting position. The movement of your hand towards your puppy's nose will eventually serve as your visual 'sit' command for him during subsequent puppy training sessions. Repeat this training exercises between 5 and 10 times each day for a week until he's sitting the instant you use the command word. Your puppy may try to turn around to get at the treat in your hand. This often happens when you've lifted your hand too far over his head. Try again, but this time, stop when your hand is about 7cm above your puppy's head. If your little boy tries to jump up at you, or begs for the treat it usually because you've lifted your hand too high over his head. Try again, but this time keep your hand lower. If your puppy isn't hungry he may have no interest in the treat, and therefore in the training. You're not going to get anywhere fast just now. Wait until he's due to be fed and then try again. You'll probably find he's a lot more co-operative when he's hungry! Puppy Training Tips To Help You Get It Right! When training a puppy, remember that any reward, whether it's praise or a treat, should be given very quickly so that your pup can form a link between his actions and the reward. before putting your puppy on his lead. 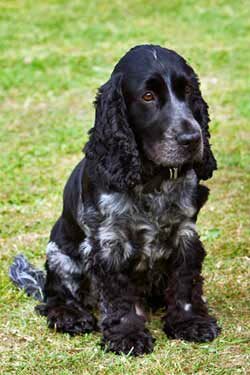 When you feel your Cocker Spaniel has mastered the 'Sit' command, try using the verbal and visual commands separately to see if he understands. Don't worry if he doesn't get it right. Just keep trying. If he continues to get it wrong, leave it for a little while and try again later. Stay upbeat and don't let him see you're disappointed. When training your puppy, don't offer him a treat every time he sits, otherwise this will teach him to follow commands only when food is offered. Instead, reward him with extra praise and a stroke, a gentle scratch under the chin, or a bit of playtime. Eventually, you will need to remove treats altogether, otherwise you'll end up with an overweight dog. Reward will need to come in the form of praise and affection only. Don't worry, your love will be enough of a reward for your puppy. Take Your Time; Don't Rush! When training a puppy to sit, don't be tempted to move on too quickly. Wait until you're certain that he's thoroughly learned each lesson. Your pup should be able to follow either verbal or visual commands without the presence of a treat. That's your goal. Once your Cocker learns a command, but then decides not to follow it, (as they sometimes do!) don't repeat the command word over and over again. If you do, it will only serve to teach your puppy that he doesn't need to act on the first command. He'll learn that it's okay to sit on the third or fourth or even fifth command! If you'd like to read more puppy training tips or puppy obedience training follow the link. Don't forget to continue to reinforce all puppy obedience training lessons at every opportunity! When your puppy has mastered the 'Sit' command, he'll be ready to advance his puppy training and move on to training a puppy to 'Stand' on command.